The Dell 2130cn Color Laser Printer offers professional-grade color printing along with a host of features designed to conserve resources. It offers fast output, simplified networking and the ability to continue printing in black with an empty color toner cartridge. And the 2130cn is easy on your bottom line with low cost-per-page color output. Compact and affordable, this printer is ideal for use in workgroups or satellite offices. The Dell 2130cn color Laser Printer delivers professional-quality color-laser printing. 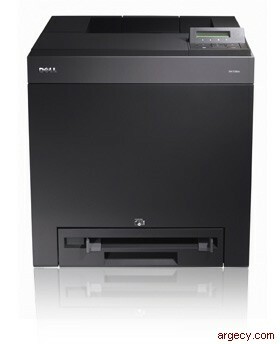 You get fast output of 16 pages per minute (ppm) color and 20 ppm black with a monthly duty cycle of up to 40,000 pages. Actual print speed will vary with use. The 2130cn delivers excellent image clarity through Automated color Space and Image Correction technology, which analyzes document content and optimizes image quality accordingly. Streamline printer networking and management duties with the Dell Printer Configuration Web Tool, a browser-based configuration interface that allows you to change settings anywhere you have Web access. Ease inventory management with the Dell Toner Management System that alerts you via email to low toner levels so that you can order supplies before you run out. Dell is one of the first to manufacture color laser printers that let you continue printing in black with an empty color cartridge. Dell replacement toner can be purchased online or through selected reseller partners. Emulsion Aggregation Toner Technology reduces warm-up times and uses less energy during the printing process, resulting in potential energy-cost reductions. Dell simplifies toner-cartridge recycling with prepaid return postage for empty toner cartridges. Emulsion Aggregation Technology fuses smaller toner particles than the standard color laser printer. The result is closer pixels and a more precise image. Emulsion Aggregation Technology can also use less energy during the printing process and allow the printer to warm and print more quickly than the standard color laser printer. Using Dell's Web-based interface, you can quickly and easily configure and manage the 2130cn onsite or remotely. This tool also lets you order supplies online and monitor toner levels and the types of jobs being printed. The Dell Color Track 2.1 color-control tool can help keep your long-term costs low with its ability to monitor and control usage across the office. Enable, disable or set limits for color printing on site or remotely via the Dell Printer Configuration Web Tool. 15.7" x 16" x 16.3"
Microsoft� Windows� 2000 SP2-4, Windows XP SP1-2, Windows XP 64-bit, Windows Vista� (32 & 64-bit), Windows Server 2003 SP1, Windows Server 2008 x32/x64, Windows� 7 support will be available for download from www.support.dell.com.